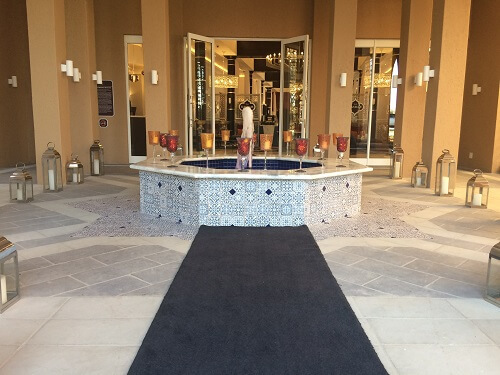 The Moroccan-inspired jewel in Polokwane should be on everyone’s go-to destination. Meropa Casino, which is operated by Sun International, brings in both local and international visitors. It’s known for its high-quality games and amazing entertainment. Let’s find out what’s in store. The Moroccan themed casino has over 400 of the latest slot machines ad 17 gaming tables. These are divided between smoking and non-smoking areas for your comfort. The slot machines take anything from just 1 cent to R25. The table games are also divided between the smoking and non-smoking floors, and the Salon Prive for exclusive gamers. Table games include blackjack and American roulette. The table games are for any pocket level, taking bets from R5 to R50 on the main floor. For those with expensive tastes, and are holders of the Platinum and Diamond Most Valued Guests (MVG) status, there’s Kiba Salon Prive. Players get access to a private entrance, VIP gaming assistance, and exclusive services. Slots are open 24/7 and tables are open from 11:00 till late. For their MVG’s, there are casino promotions where players can win all sorts of prizes. There’s also the Meropa Horse Race promotion which runs every Monday and Thursday. There’s more to this beautiful complex than just gambling. The Meropa Hotel boasts an upper three-star rating. Run by Sun International, it is inspired by the exotic Moroccan grandeur. The Meropa Hotel has 54 rooms and 6 luxury suites. It is one of the most highly rated hotels in the entire city of Polokwane. A stay at the hotel come with a breakfast buffet, and modern amenities such as DStv and WiFi. There’s non-stop entertainment and a variety of options at Meropa Casino. Head to the Jembe Tavern for some traditional cuisine, drinks, and live DJ entertainment every Friday and Saturday evening. For those looking for a bar and club scene, this is the place to be. Guests can also enjoy a sumptuous meal at the Harvest Grill and Wine. Alternately, they can enjoy sundowners, cocktails, and a light meal at Ngoma Bar. There’s the House of Asante Spa, a perfect spot to relax and let the professionals unwind your muscles. It fits in beautifully with the Moroccan-inspired Meropa. Book couple’s massages, or go in for a facial and pedicure, the choice is yours. Those looking for some adventure amidst the wild animals should head to Wild Thingz, an animal park located in Meropa. Here you’ll see birds of prey, reptiles and insects, and a kaleidoscope of birds. They host bird shows and snake demonstrations as well. Meropa Casino has a conference venue and meeting room. Each can accommodate 600 and 20 people respectively. The conference centre is also used to host big events like concerts and comedy shows. Check the Meropa Casino website for dates. Next time you need to plan a holiday for yourself, with your partner, or with extended family consider Meropa. For more casinos in Limpopo, find them on CasinoZA.com.